The Boughey or Boghay family came to live in Colton sometime in the late 1540's probably from the Audley area in north Staffordshire. They were a family of Yeoman farmers who had prospered by good marriages and wise land deals. They purchased the farm in Colton that had been previously known as The Grange from George Fowler who had acquired it at the Dissolution of the Monastries from Henry VIII. It had previously belonged to St. Thomas's Priory in Stafford. The cost of purchase by the Boughey's was £100. Sampson, the first of the Boughey's in Colton, renamed the farm Boughey Hall Farm and entered Colton village society as a fairly prosperous land owner. Sampson, his son George and in turn, his son Sampson, all hold various offices within the parish over the next century. The last Sampson Boughey died without male heirs in 1658 and the estate passed to his five daughters. The youngest daughter Constance married Whitehall Degge, son of Sir Simon Degge a distinguished Staffordshire judge and antiquarian. Whitehall and Constance bought out the other sisters for £750 and became the sole owners of Boughey Hall Farm. Constance had two children by this marriage, the first, a little girl, died in infancy. Shortly afterwards her husband Whitehall died and Constance was left a widow with a son. The Boughey's were a Catholic family and in 1678 Constance married again, this time to a very prominent Catholic, Thomas Whitgreave of Moseley Old Hall near Wolverhampton. Thomas Whitgreave was famous for being one of the rescuers of Charles II as he fled from Cromwell's troops after the Battle of Worcester. On his accession King Charles had rewarded Thomas for his brave help. 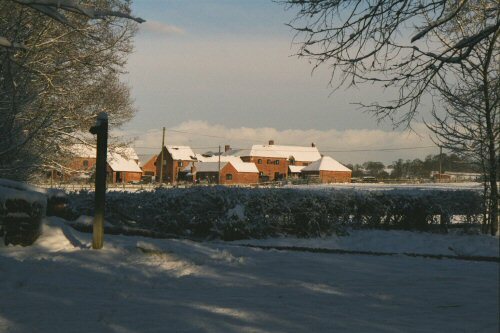 By this marriage Boughey Hall farm passed into the Whitgreave family and remained so until the 1920's. When Constance remarried she went to live at Moseley Old Hall taking her son with her. Moseley was an important centre for Catholics in the area and they frequently secretly harboured Jesuit priests despite the risk to their lives for doing so. Sir Simon Degge, her father in law by her first marriage, knew this and began proceedings in the Star Chamber to gain custody of his young grandson so that he could not be brought up in a Catholic household. Unfortunately for Constance he succeeded and she was never to have contact with him again.